You are here: Home / Damp / What the hell do these moisture meter readings actually mean? or, Have I got rising damp or not? Electrical Moisture meters for damp diagnosis – oh yes. A thing that raises an eyebrow amongst some independent surveyors is the way we so called ‘specialists’ seem happy to diagnose rising damp, or damp of any kind, using nothing more than our eyes and a conductivity moisture meter. “Ha; I can get a reading off my fingertips or my head; I must have rising damp” scoff some. It’s true; these meters give only a qualitative measurement. The figure is accurate, only in it’s relativity, to the previous reading – or the next. It will tell you if your head is dryer than your hand; even by how much; proportionately. These meters cannot provide a true moisture content in masonry, plaster or indeed anything but wood; which many of them are calibrated for (and even then it’s only an approximation). I know I’ve blogged on this before and you know all this already. But Graham Coleman has kindly sent me the table he drew up a long time ago and which all CSRT and many CRDS qualified surveyors will be all too familiar with, (though there’s always room for a quick refresher, hey lads)? It’s the sad case that when I follow other surveyors on properties, where these meters have been used and where sometimes, diagnosis has been given; I often spot a problem. It’s the position of those little pairs of holes, which the meter pins leave behind; on the wallpaper and the paint. The thing is; they are almost invariably, just above the skirting board, maybe pearceing the plaster, an inch or two up and perhaps spaced a metre apart or more. They are rarely anywhere else. What could these readings possibly tell the meter user? Not much, I’m afraid. Maybe they were all very low? Well I suppose that’s something. Or maybe very high? Well there’s damp of some sort isn’t there? Oh dear; I fear they didn’t actually provide anything really usefull, from a damp diagnosis point of view. What a waste. Look at Graham’s table; it’s the damp specialist’s version of Mendeleev’s periodic table; there may be gaps and things to add, but I think it’s a simple work of genius. I know that reciting the periodic table doesn’t make you a chemist. In the same way, printing this and sticking it under the lid of your survey tool-box will not make a specialist of you. But is there a decent chemist who never checks the periodic table, just to check he’s on the right lines? So, when surprised by that sudden, ardent bleeping from your meter, what to do? Take a look at the readings and then work away – up and left and right and maybe the skirting, (not relative), and repeat. Think and look at the table. You’ve already looked outside and all around the area, so do that again. Then when you’ve finished, you will almost certanly have a very accurate diagnosis. My thanks go to Graham for the table and his tireless work in drumming all this stuff into my thick head over the past few years. Please remember that this is Graham’s work, not mine. If you want to copy it for your workbook, toolbox or thesis do so, but make sure Graham’s name stays on it please. If you would like to use it commercially – ask Graham first; it’s his. Oh, I forgot – nothing is ever written in stone; this is Graham’s take on his table……. “These are some possible interpretations of moisture meter readings recorded at low level from walls; all have been validated by sampling and subsequent testing. There may be other interpretations of the same patterns but these are likely to be the most commonly encountered. There may also be other patterns but these are likely to be less common; for example, low level surface condensation might give a pattern similar to pattern ‘A’ but it will be purely a surface effect and highly likely to be obtained only during the colder months of the year. The important feature when using an electrical moisture meter is to record both vertical and horizontal patterns – one needs to interpret the pattern, not the actual figure. Remember, the patterns given are ‘possible’ interpretations.” Oh yes, pattern ’F’ – the damp-proofers nightmare – no work! Beware those who do not note ‘possible interpretations’. The surface moisture profile of rising damp is replicated by underfloor condensation (timber floors), leaks (all floors) and other problems. I agree to an extent. – Damp diagnosis is a specialist job and requires anyone doing it to consider all potential factors, which could give the profile. However, as a damp specialist I am expected to give my client a diagnosis, based on my survey. Most of the time I’m happy to give one and I rarely need to add any caviats like – possible – may be – could be or possibly.. Customers don’t like wishy washy reports so I try to avoid this. There are times though, when one is stumped or the evidence does indeed point to something ‘not quite right’ – in these cases I agree that further investigation is needed. It’s not always straightforward. I like overview patterns as they help you form a framework for investigating many things. Grahams work is very useful tool. I will put it in my brief case. I believe it is important not to mix fact with opinion and sometimes on initial inspections it is not possible to undertake tests to categorically define a cause as a matter of fact so possibilities have to be used to explain risk. It may be that further tests are recommended and the balance of the do nothing option explored. I assume “Dry rot” does casework which involves destructive testing until a result is certain and so he is right that all his comments can be expressed as factual. Surveyors must be careful not to sound authoritative by stating opinion as fact.This is where the word possible is useful. The client can expect your skill to assess a scale of risk in such cases so some measure should be found so as not to render comments valueless. Nice to hear from you. I’m a big fan of Graham’s profile table and I’m glad you like it too, so simple and very intuitive. I’m wary of getting too hung-up on semantics, where opinion and facts in reports come in; the spectre of the court room has a lot to answer for. I see too many survey reports which are so full of caveats and hedged bets, that their value to clients is dubious, to say the least. These reports are often the most expensive and lengthy ones too. Giving my clients good information is the goal, but they shouldn’t be expected to understand all the technical issues (though some are fascinated by it and I like to indulge them when they are). Perhaps they may not have the time or inclination to want to ponder these things? In receiving my report, the last thing most need is a list of ‘maybe this’ and ‘maybe that’s’. The diagnosis ought to be direct and specific; this can be given, without destructive or invasive testing – most of the time…………… in my opinion. I’ve talked about this with Graham and others, who confirm that in over 95% of cases, a damp diagnosis, which is made using a moisture meter, common sense, experience, profiling and some methodology is correct, when checked later, using destructive lab methods. Should we hedge our bets in a report and burden clients with risk analysis, and the pros and cons of this and that, for less than one twentieth occasions, when profiling may be wrong? Of course, the above ratio assumes that all users of electrical moisture meters know how to use them, which is the rub and the reason I support the damp diagnosis group’s aims. I bet that the 1:20 ratio can be improved on and maybe reduce to nearer 1:100 if we all work together. I wouldn’t expect such a low success rate with my own meter or the majority of surveyors like yourself and other damp diagnosis group members, who are enthusiastic and serious about their work. waht do the numbers in the table represent? they are units of what? The numbers are relative only. They can be described as ‘per cent’ when the meter is being used in wood, because most meters are calibrated for average softwood. In masonry the same scale is used but if % is mentioned it is termed % WME – that is wood moisture equivalent. So that we if you see WME you know what the meter was reading – you don’t knoe how much water was there. In damp diagnosis it is often the relative distribution of moisture which tells a surveyor the most, rather than the exact moisture content. Thank you for looking in, I hope the article helped you. Hi im really disappointed i bought a stanley damp meter at B & Q for over £ 40 pounds yesterday i explained the problem to the chap serving me. He assured that information was inside the packaging on how to understand and interpret the readings. Got it home applied it and got severals readings which i cannot make head nor tail of flipping eck how maddening is that? From trolling on the web it appears to be a large problem and not just down to us blonde women (sorry blondes)! Could some one please just tell me if the readings are around 0.6 on the wood percent side , is this a problem or not ? If the outside brickwork after a dry period is reading around 20% is this a problem? (its above damp proofing). Many thanks if someone can help me make sense of this. I’m afraid that the readings taken outside should be forgotten about – they will fluctuate by the day and cannot be relied on. Remember the the damp meter readings are only accurate in timber – so 20% in wood is actually (about), 20%. Anything much above that in timber will cause rot unless the timber is protected by preservative. 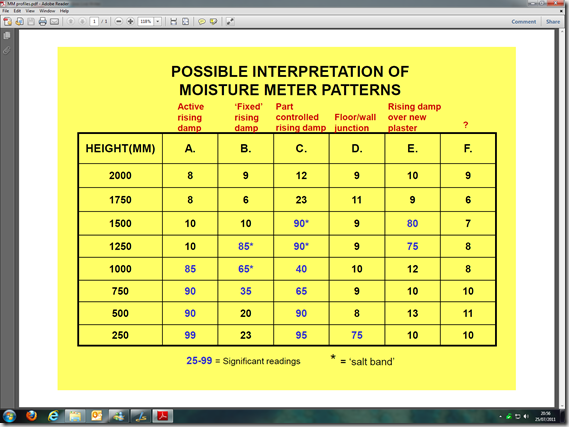 When used in plaster – masonry or brick the readings are only qualitative – not quantitative. Indoors as a guide (though this is for a Protimeter MMS), not a B&Q DIY unit, I tend to ignore anything under about 24 in old houses… these meters are very sensitive and will pick up moisture that is just not a problem. I never recommend DIY use as it takes years to really get to grips with these things in buildings. If there’s no damp staining, salting, peeling or any other sign of damage then I’d say don’t worry about it. If you still are though, get advice via the PCA web site, to find a local contractor – independent surveyor or consultant. I’m confused. Caroline’s question gave a figure of 0.6 but the reply was about percentages. Does this mean she has 60% moisture? That can’t be right. Our contractor got a reading of 0.9 on plaster and said it shouldn’t be more than 0.4? How does this tie in with percentages? Unfortunately I don’t know the moisture meter you are using so cannot tell what the readings are calibrated in. However, be very careful with anyone stating what is high and low on a meter on plaster. These meters can throw up very widespread levels and really, only an experienced surveyor should be using one. Also, one-off readings are not particularly useful. A moisture profile obtained by taking lots of readings across the area is the only useful way of using these meters on plaster or masonry. This doesn’t apply to readings from wood, where the readings can be taken as quantitative (as long as the levels are not very low or very high (over 35%), in which case just say they are very low or very high. Ther is no way that you should be seeing mould inthis way. I would demand a new kitchen if it were me. Ther really should not be so much water that the amount of evaporation causes this. If the walls were wet plastered and then a kitchen installd the next day, well, that could do it. However, this is still a defect and the builder should rectify it IMHO. Any reading over 20% in internal joinery of any kind is way too high. You should be looking at between 8% and 14% max. 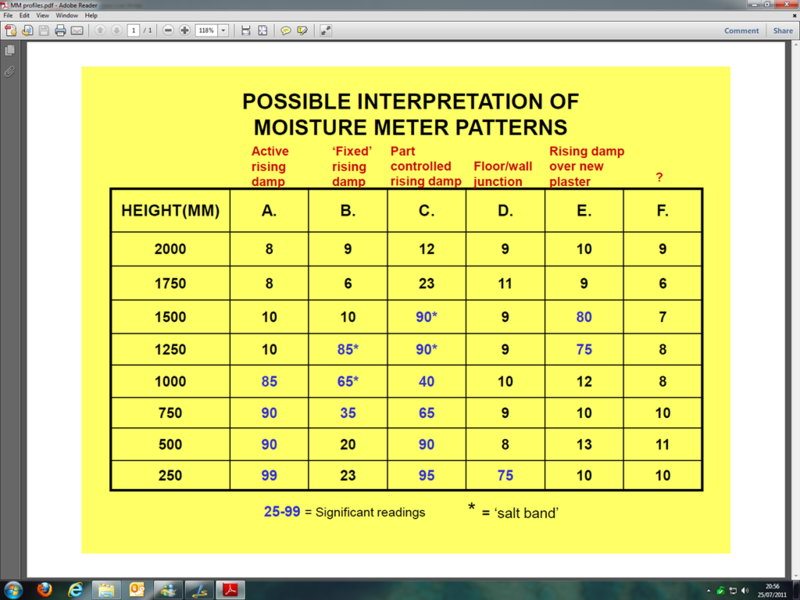 – Moisture meter testing showed readings in excess of 40% WME (wood moisture equivalent) to the porous plaster on walls. -As readings exceed 20% WME remedial works are deemed necessary to this area. – High plinth absorbing moisture from blocked gully. As the council are the freeholders things are not moving very fast.. Can you tell me if the readings on the hygrometer are considered reliable. Someone told me that a comfortable reading would be between 45 and 50. Obviosly with the readings I have I am very concerned. What do you think the remedial works will entail? I feel that to get the place dried out I should hire some industrial dehumidifires but am wondering if this is wise, should I wait for the council to do the work first? The first thing is to fix the external defects. Then please read the following post If the flat is not occupied now I would make sure the heating is on (low) and the extract fans left running to dry the house. The hygropmeter readings are meaningless without lots of details such as occupancy, external vapour pressures and temperatures. Relative humity in homes should be kept below 60% if possible. However, be carefull, a perfectly dry house can have an RH of 75% plus, if it is cold (RH rises as air cools). I am trying to trouble-shoot an odd problem with condensation depositing on my fridge seals (on the outside of the seals, where they are exposed to the air). Is there any very basic way of testing whether the air in my kitchen is damp? For instance, leaving out a bowl of bicarb and seeing if it clumps? The kitchen has not been in use for more than six months, so I am certain that the condensation is not from cooking, boiling kettle etc. In the next few months I will be having the floor taken up and renovations done, so if there is a damp problem I will get experts in to deal with it then. In the meantime, I just need to know whether there is something wrong with my fridge or if the problem is damp air. I think the clue is in your comment – “The kitchen has not been in use”. This means that the kitchen is probably on the cool side. Thus the RH will be high anyay and it wont take much of a drop for 100% to be reached – such as at the seals…. I am selling my house built in the 1920’s to some jittery first time buyers. They are about to have a survey done (homebuyers report) in the next few days. I bought a meter with the sharp prongs from Amazon (a German make) which has been reporting a % of around 20-25% in an outside kitchen wall, the plaster is a little soft (was re-plastered in March) in places and the wall is always cold to the touch. The reading from the skirting is 5-6%. Is this likely to be a significant issue on the survey? I don’t mind dropping the price but get the feeling our buyers will run faster than Mo Farah at the sound of “damp”! This was a good read! Thanks for writing an informative blog. Keep sharing more blogs with more useful information.